Our Red Wattle, Duroc, Berkshire, Hampshire Pigs are born, bred and raised at the Piper Ranch Farm. We believe in QUALITY not QUANTITY! That's why we do not add growth hormones or use antibiotic feeds. Our pigs are grain fed, 90% barley and 10% oats. Our pigs are not fed whey. Now you and your family can enjoy the organic grain-fed quality pork that has been on our family's dinner table for years. 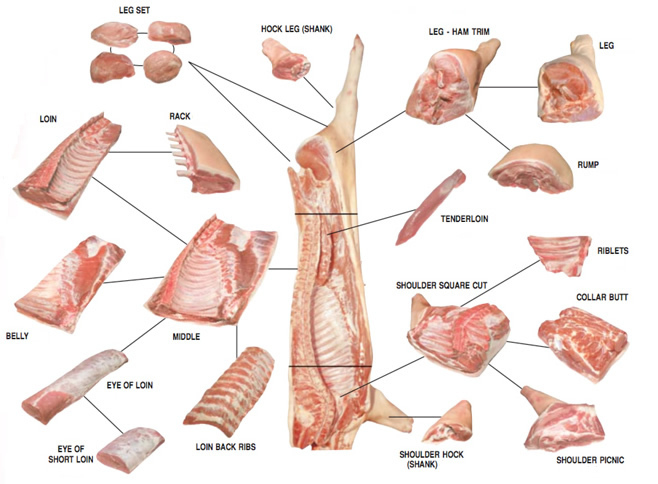 Pastured pigs are generally leaner than strictly grain fed pigs. They also have more of the good Omega-3 fatty acids and lower in the bad Omega-6 acids. 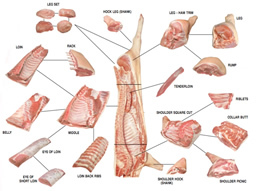 This means a pastured pig is healthier for you. A typical finished hog is 200 to 240 pounds hanging weight at slaughter. Other cuts are available upon special order. Our Sausages are nittrate free and come in links.